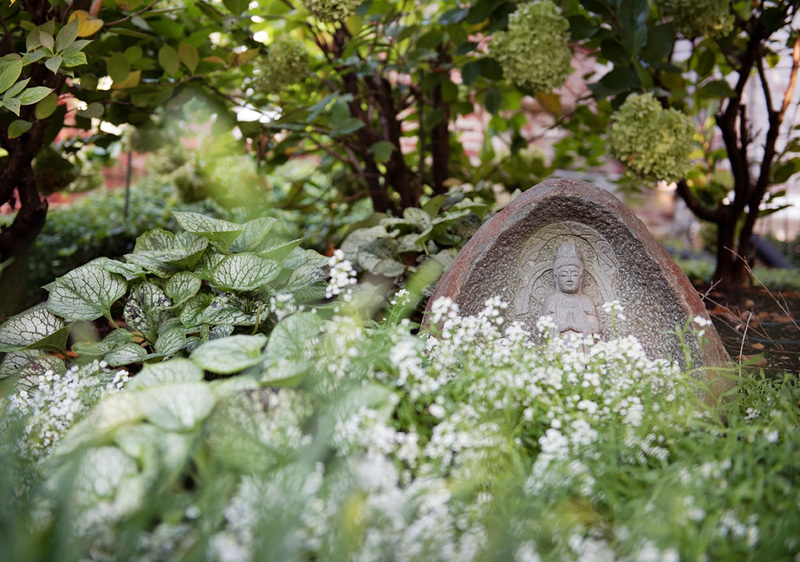 With a little tender loving care and an open mind for what their neglected landscape could become, Westwood homeowners transformed their garden into a private, tranquil sanctuary. 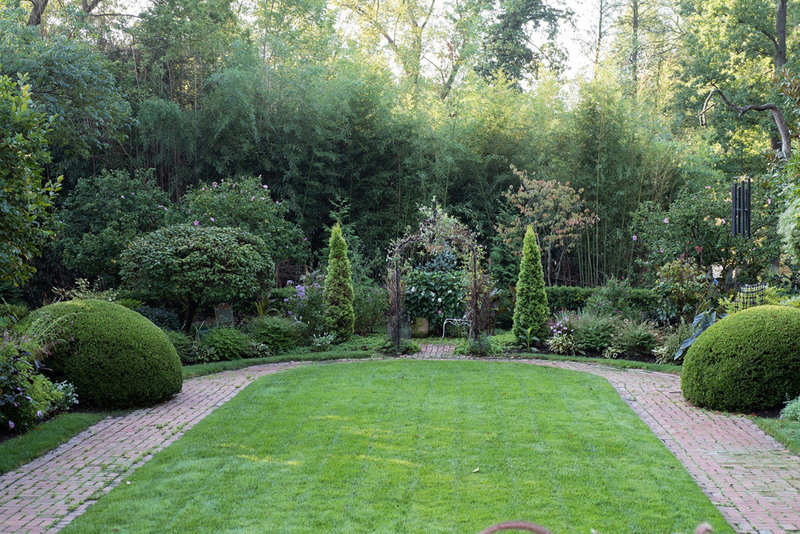 See this garden on the Garden Conservancy Open Day tour on June 16, 2018. It was the word that these Westwood homeowners focused on when they purchased their current home 15 years ago. They saw possibilities in the two-story brick colonial residence built in the 1930s, which had been vacant for three years. They saw possibilities, too, in the once lovely surrounding garden with its existing beautiful brickwork and wrought-iron fences even though many areas were choked with bush honeysuckle. They had faith that those features that supplied structure and pathways in the garden could be reclaimed to create a private and tranquil sanctuary. What both needed, they were sure, was tender loving care supplied by people who nurture both houses and the landscape that surrounds them. Particularly, where the garden was concerned, what the homeowners soon learned that in addition to love, they needed patience. 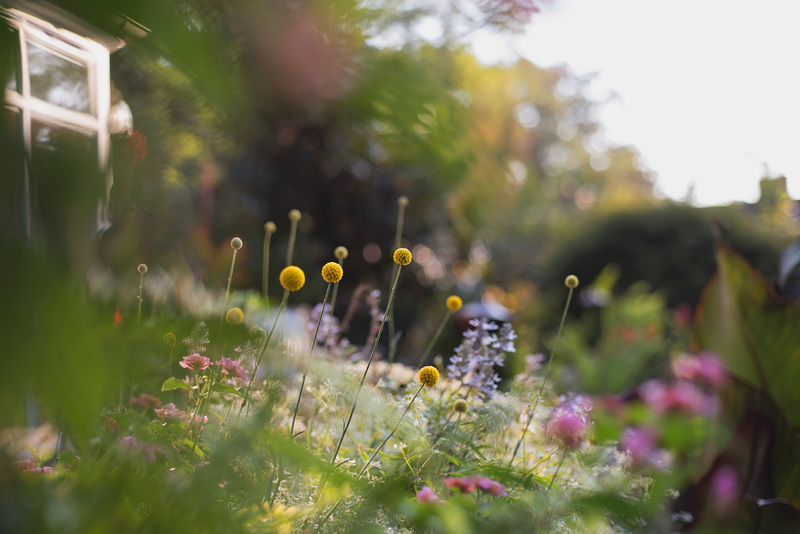 Without human beings to shoo them away, the garden had become a haven for wildlife, particularly rabbits who happily munched on the new annuals and perennials the homeowners tried to introduce. In addition, the honeysuckle seemed to have a proprietary interest in remaining where it had become so comfortable and happily overgrown. “With honeysuckle, you don’t prune it…you harvest it like a hay crop,” quips Bob Dingwall, who has been working with the couple on the design and plant palette of their garden for the past four years. The brick-floored outdoor eating area just off the home’s living and dining rooms provides a vista into the carefully symmetrical European courtyard garden, yet is somewhat screened from the garden surrounding the pool. In the courtyard huge, mounding boxwoods seem to bubble over the brick pathways lining both sides of a grassy lawn. A wrought-iron arbor planted with climbing pink honeysuckle and clematis provides a focal point at the end of the lawn and offers a peak into a secluded sitting area beyond. Pyramidal arborvitaes just beyond the arbor seem to stand guard at the entrance to the private space. 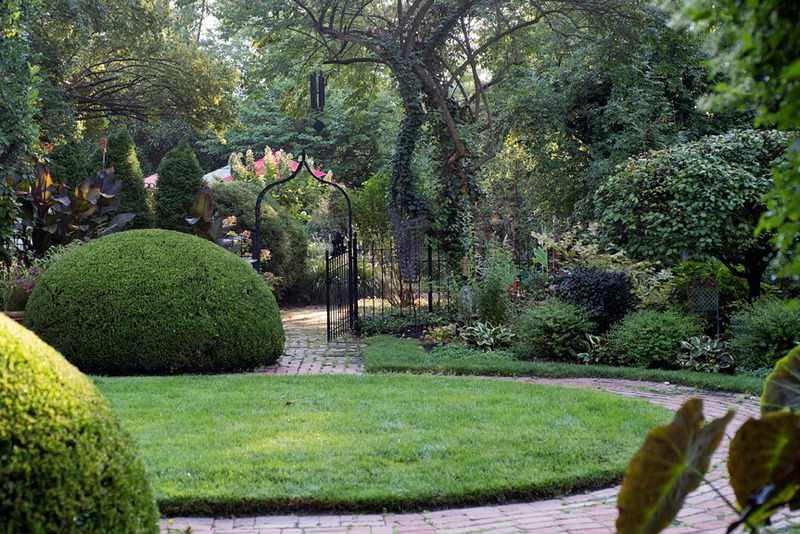 On the left side of the lawn, a wrought-iron gate beckons garden visitors to stroll down a shrub-lined brick walk. 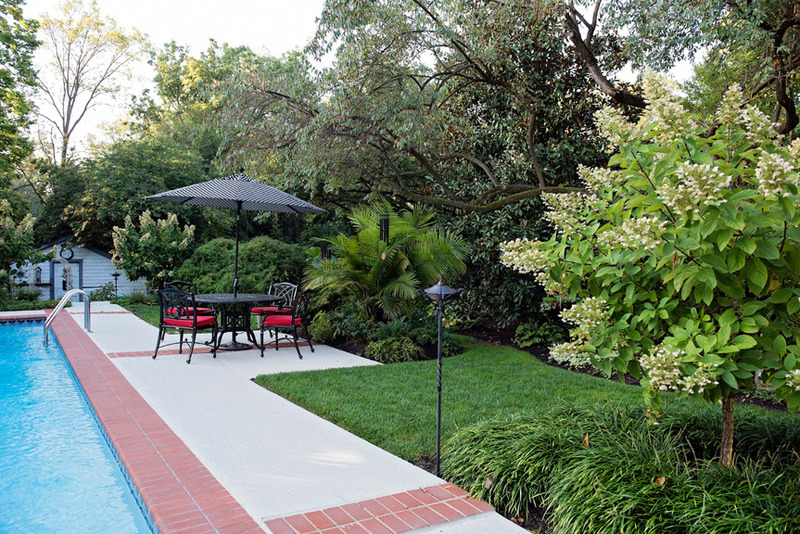 That path will eventually lead to the secluded swimming pool, which boasts its own private garden accented with a grassy lawn and mature flowering shrubs. 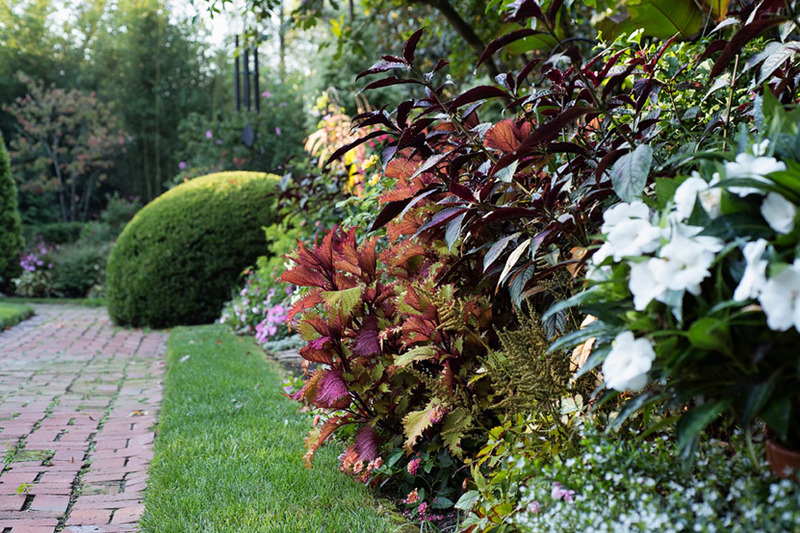 Along the pathways flanking the courtyard lawn, a veritable botanical garden of colors and textures provides delight to the eye. 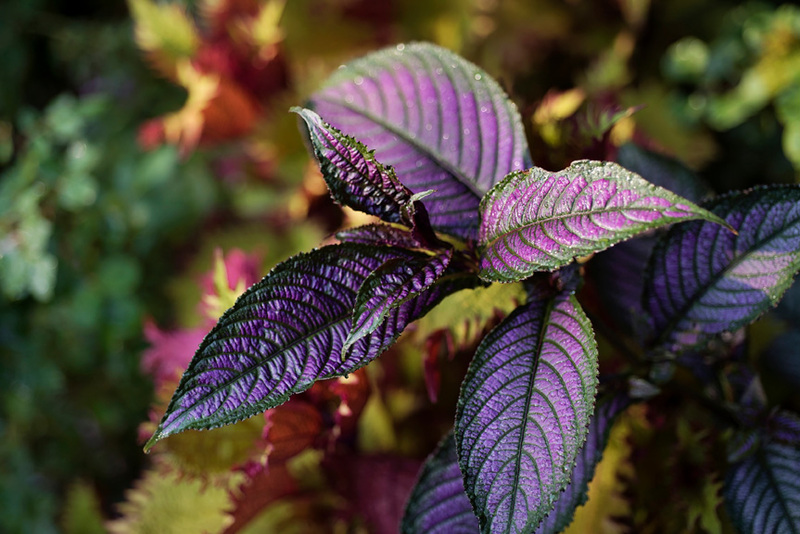 Hostas and multi-colored coleus blend with tropical elephant ears and containers of grasses and impatiens. The homeowner has made liberal use of containers to add variety and height to the garden and well as keeping plants safe from marauding rabbits. 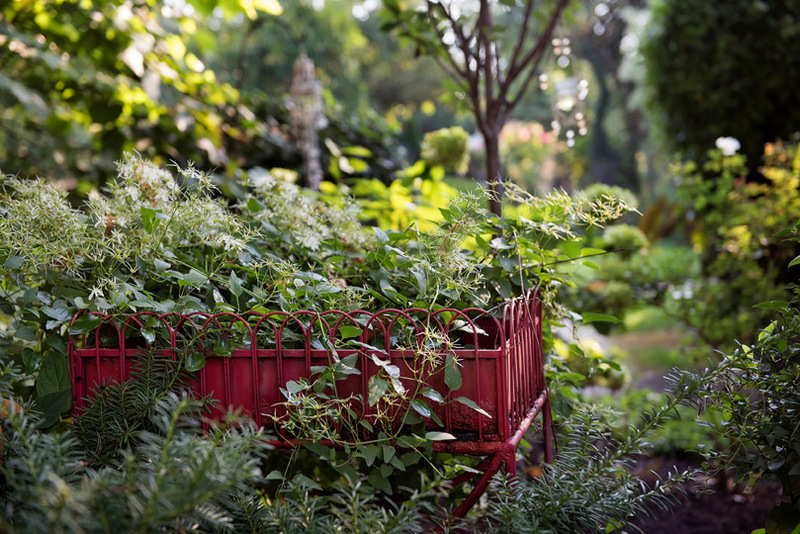 As well as her passion for containers and adding them to her garden, the homeowner also is adamant that the garden be a treat for the senses. Some 20 fountains are incorporated into the landscape, so the sound of splashing, flowing water carries the visitor from one area to the other and links all the spaces. In addition it brings many birds into the space. Wind chimes with their melodious sounds bring another sensory aspect to the garden. 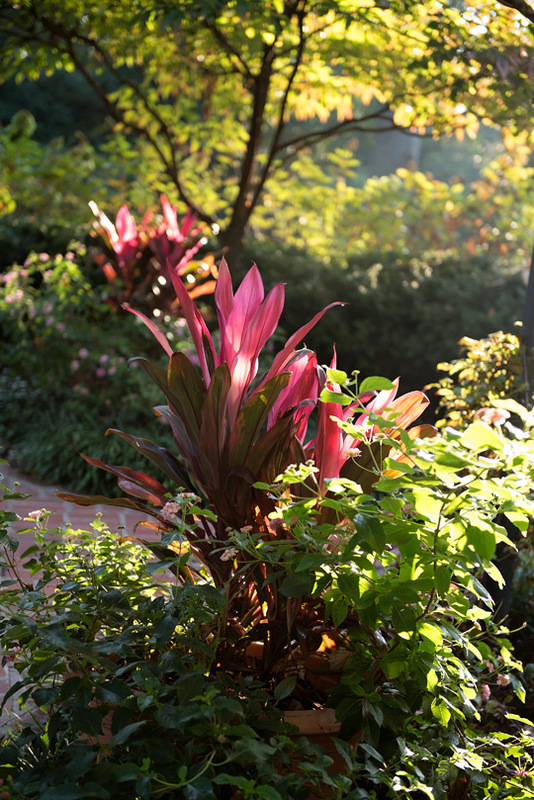 Fragrant plants also add richness to the landscape and create a scented pathway from one area to another. All these aspects, the homeowner feels, bring a sense of peace and tranquility to the garden visitor. 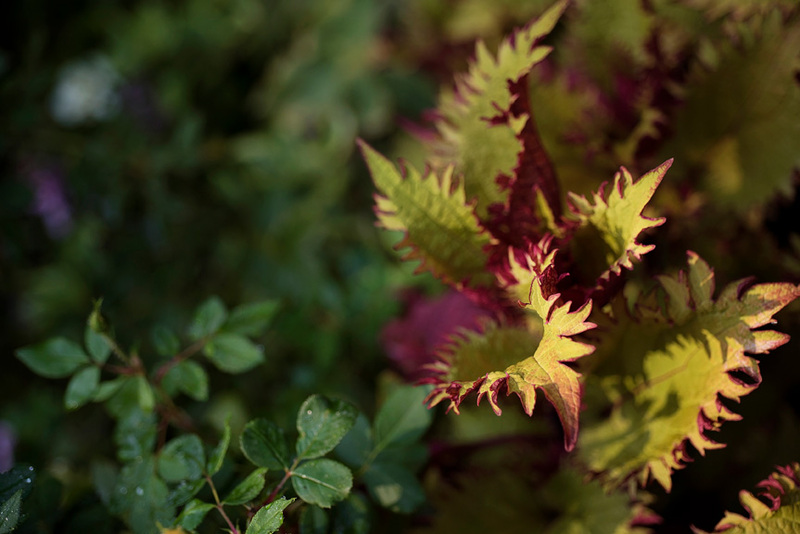 While the homeowners had created a lovely garden on their own, four years ago they turned to Bob to add additional variety to their garden and help create year-round interest to the landscape. One of the aspects of the garden that drew Bob’s attention was winter interest. “There are so many windows from the house onto the garden, you really have to think of the winter effect,” he points out. He concentrated on adding conifers in various hues. “There is so much color available, it is a misnomer to call them evergreens,” he points out, noting shrubs such as golden false cypress and Blue Atlas cedar. He also added a number of evergreen nandina bushes, also known as heavenly bamboo, for their lacy texture and leaves that turn to a rich red in cold weather. 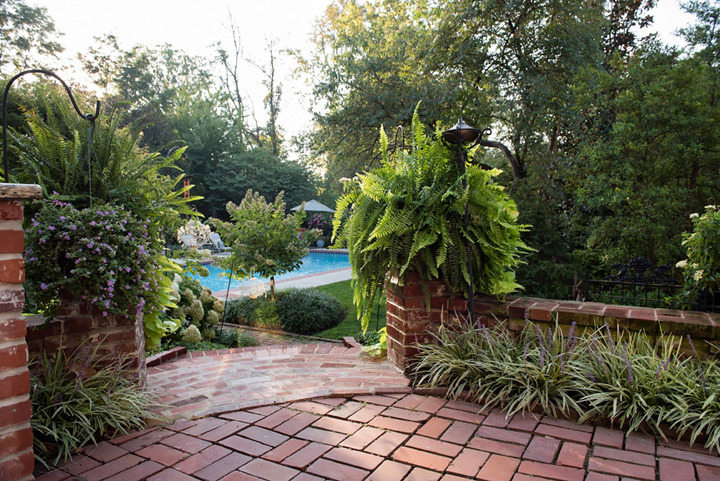 For summer beauty, Bob added mass plantings of Annabelle and Limelight hydrangeas, both of which are very winter hardy. Because they bloom on new wood, they can be pruned back in late winter to somewhat control height. Particularly striking is a long row of Limelights hidden behind the box hedge surrounding the outdoor dining area in spring. As time goes by, they emerge to create a frothy layer of triangular, mop-like blossoms that change from lime green to white to rose as summer progresses. Dwarf Japanese maples add multi-season architectural interest and soft green color and texture. The addition of burning bush to the landscape provides dramatic pops of phosphorescent red in fall. 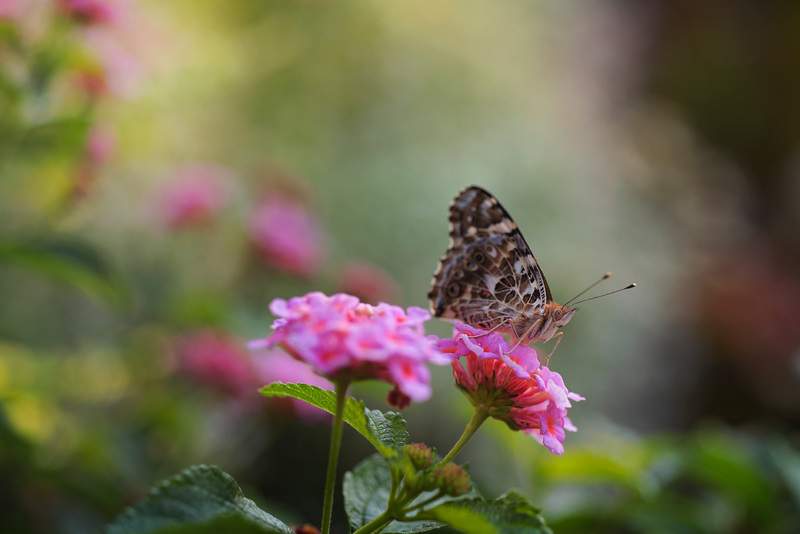 The homeowner’s office is on the second floor of the house and looks out over the garden, so even when she is indoors, the garden is a part of her life. 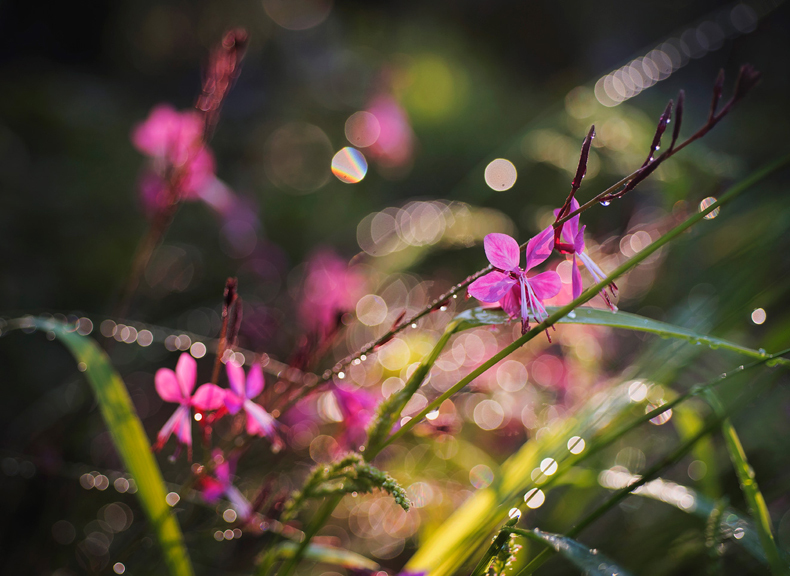 No matter what the season, the homeowners try to begin each day with a walk in the garden and end the day in the same way to enjoy nature and appreciate the seasons of life.